Takeaway: Spring is an ideal time to move your indoor garden outdoors and into a greenhouse. Many of the principles behind operating a successful indoor garden apply to greenhouses. Inside, things like lighting, ventilation, irrigation and heating all need to be optimized to run an efficient greenhouse, while outside, the unit’s shape, materials and the amount of sunlight getting through are all important things to note. 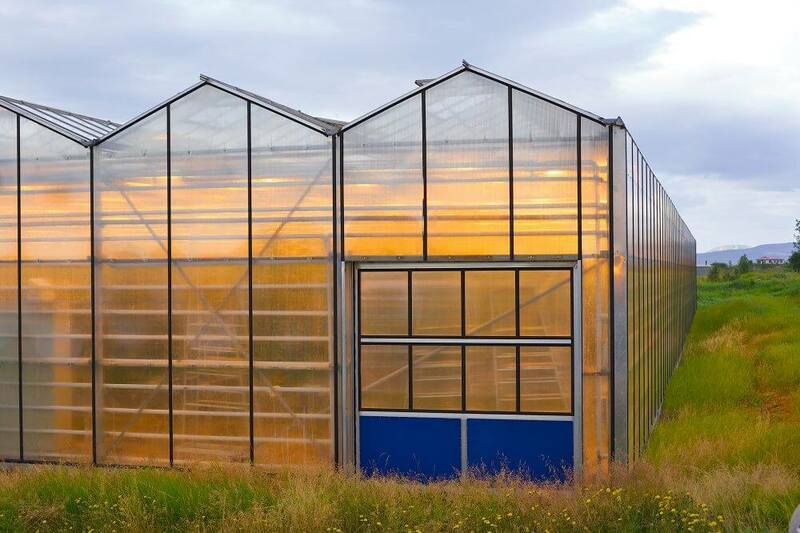 Whether it’s a free-standing, commercial greenhouse, or a modest backyard enclosure, the principles of running an effective greenhouse are the same. To grow plants in a greenhouse, you must consider the materials for the structure and how the systems within it function. Keep the following pointers in mind when evaluating your existing structure, or constructing a new one. The shape, materials used and the amount of natural light that is able to enter the structure are all important considerations when it comes to sorting out the essential components of a greenhouse. Shape – Almost all greenhouses have either a rounded top (Quonset styles) or a gabled top (gothic styles). Most hobby growers opt for the Quonset type of greenhouse, while professional growers typically use gabled greenhouses. Gabled greenhouses can be installed in rows and connected at the gutters. They are also better for heavier exterior materials like glass or fiberglass, while Quonset greenhouses are usually covered in plastic. Materials – The bones of a greenhouse can be constructed using several different materials. Aluminum and steel are the most common frame materials. Most small-scale growers opt for aluminum, as it is lighter, more cost-effective and can be bent to shape for custom greenhouses. Wood is another option, although it is rarely used. Untreated wood tends to rot quickly in humid environments, while treated wood can give off fumes that are toxic to plants. The translucent materials on a greenhouse may be glass, fiberglass, or various types of plastic panels or sheeting. Glass allows the most light to come into a greenhouse, but it is costly, requires more materials for support and is the most prone to breakage. Fiberglass, while strong, can break down under the constant exposure of ultraviolet light. Rolled plastic sheeting is the cheapest option, but needs to be replaced frequently. The most common materials for both amateurs and professionals are plastic panels or sheets. Many greenhouses are outfitted with a double layer of plastic sheeting, separated by a layer of air supplied either with spacer blocks, or an inflating fan that continually supplies positive airflow between the sheets. This dead air adds to the insulation value of the covering. A similar principle is at work when using double-walled polycarbonate panels, which are almost as clear as glass, are easy to cut to size and last for many years. If you can afford the initial investment, double-walled polycarbonate panels have become the standard in greenhouse production. Shading – No matter what material you choose to glaze your greenhouse, you must be able to increase and decrease the amount of light that enters the structure, according to the seasons. Many growers shade their greenhouses during the summer to reduce the likelihood of excessive temperatures inside. Options for shading a greenhouse include white shade cloth to reduce the amount of light energy entering the greenhouse, or white paint or another liquid-shading compound that is applied to the roof, or at least its south-facing portions. White plastic sheets can create the appropriate amount of shade as well. In addition to the items above, you must also consider the systems that make up an effective growing area. Your choice of growing methods will affect the other choices you need to make regarding structural and external materials. Heating, Cooling and Ventilation – Heating, cooling and ventilation are three distinct systems, but they need to be considered collectively. Choices for each will need to be made based on the type of crops grown, the direction the greenhouse faces and the climate surrounding the greenhouse. There are plenty of options for heating a greenhouse. In addition to the sun, greenhouses can be heated by natural gas, fuel oils, wood, geo-thermal power, hot water, steam or electricity. Some growers are even able to obtain some heat for their greenhouse from their compost piles if they are close enough to the greenhouse. Other non-conventional methods of heating a greenhouse include adding barrels of water around the greenhouse and having large amounts of natural stone within the growing area. Both of these will collect heat during the day and then radiate that heat back into the greenhouse at night. The majority of greenhouse cooling is achieved through ventilation. Ventilation options can be manual or automatic. Manual ventilation systems are less expensive, but require constant attention to make sure crops do not overheat. There are also options for vents that open and close automatically without using electricity. These ingenious systems employ a spring and wax in a chamber. When the weather gets warm, the wax melts and releases the spring, which opens the vents. As the weather cools, the wax hardens and contracts the spring, closing the vent. Other ventilation systems can be quite sophisticated and can operate autonomously with a variety of environmental factors considered. 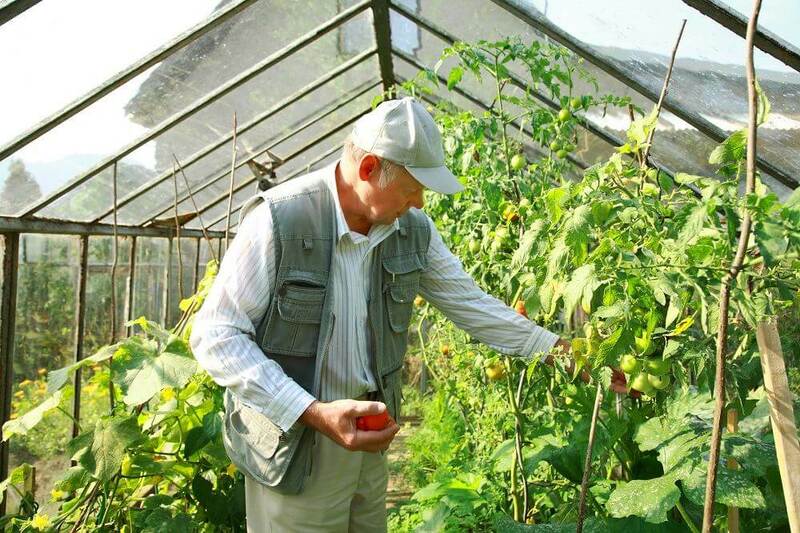 For example, the greenhouse owner can be contacted remotely by sensor if the system fails, or if there are conditions inside that may endanger the plants within. Horizontal airflow should be constant, regardless of the type of ventilation. Horizontal fans can be installed to deliver a constant supply of moving air, which helps with temperature regulation and reduces the incidences of diseases in the greenhouse. If additional cooling is needed for the greenhouse, more fans can be installed. Other options include additional shading on the roof and side panels, or installing an evaporative cooling system. These work by lowering the temperature of the circulating air, pulling it in and exposing it to moisture before re-releasing it. Air conditioners are not generally used in greenhouses, but could be considered for smaller growing areas, so long as the humidity of the growing area is monitored, as air conditioners remove moisture from the air in the process of cooling it. Floor – Greenhouse floors must be able to tolerate constant moisture. A non-slip surface for walkways between plants or benches is a must. Gravel is an effective and relatively inexpensive option, but it is often not practical in commercial settings where carts are used. Porous concrete is often used in these settings instead. Other flooring options included fiberglass planks, brick, stone or even ground bark. When using any material prone to decomposition, keep in mind it may provide environments that foster pest insects and diseases, which could negatively affect the crops being grown. Also consider floor heating in some climates. The slope or pitch of the floor should be considered as well. For safety reasons, and to reduce the chances of diseases, water should not be allowed to collect anywhere on a greenhouse floor. Drains should be installed, if possible, and sanitized often so plant diseases do not have an additional place to breed. Irrigation – Much like ventilation, irrigation can be as simple or as sophisticated as your resources and desires allow. Plants can be watered manually via watering cans or hoses, or irrigation can be supplied via overhead misting systems, automatic drip irrigation or even ebb and flow benches, which are useful for bottom-watering plants. Misting systems are a worthwhile investment if you plan on nurturing cuttings in the greenhouse, as they will help you maintain the higher humidity levels required for effective plant production. Whatever your irrigation method, water quality should be tested on a regular basis. This can be done on-site with a variety of DIY kits, or you can send a sample to a lab for analysis. Most land-grant and public university extensions either perform or can direct growers to a local source for this service. When it comes to installation, a constant source of water is necessary. For growers on a municipal water system, this is usually not a concern, but for those who obtain water from a well or pond, it is vital to ensure there is a mechanism in place, or a reserve of water, in the event the power fails and pumps can’t run. If you have enough space, it is a good idea to collect rainwater from the gutters of the greenhouse. Not only is this move environmentally friendly, plants typically respond and grow better when they are irrigated with rainwater. Lighting – If your plants require more light than what can be supplied by the sun, supplemental grow lights will need to be installed within the greenhouse. It is best to know if grow lights are intended to be used before constructing the greenhouse, as its structure and electric capacity will need to be considered. If this is unknown, it is best to make sure the electrical panel serving the greenhouse has room for expansion, and that the structure is strong enough to hold the weight of the lights and ballasts. The factors presented here are essential components to consider when it comes to greenhouse planning. Time spent planning your growing space is as important as time spent propagating and growing your plants.